When I was a kid and even later in life, it has been a family tradition to watch the Vienese Philharmonic Orchestra’s performance on television in the morning of January 1 each year. Many people whom I’ve known, got up in the morning of the first day of the new year and watched the concert regardless of how sleepy or hangover they were after their new year parties. 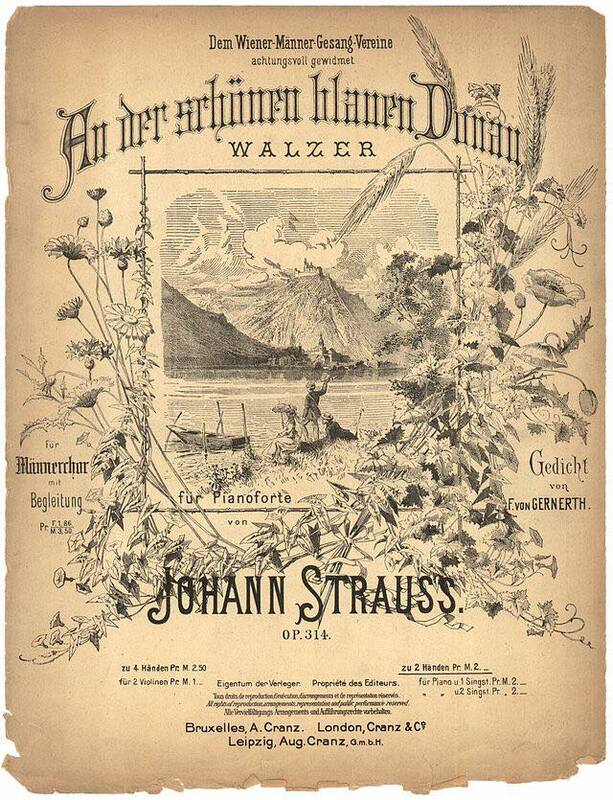 As a kid, the “Blue Danube” by Johann Strauss II was the highlight of the televised new year’s day concert. I guess, for no particular reason. Of course it has catchy tunes that has turned into a lifetime jingle (especially when driving along the Danube in Budapest in an afternoon traffic jam…), because my mother always talked about it during the concert and overtime the stories she said has built up my expectations. 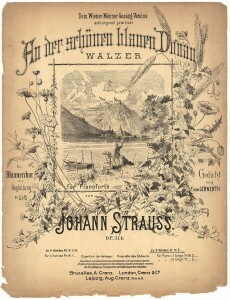 Also, because of the waltz’s dreamy title, “The Blue Danube…” and the awesome superimposed photos of the cities along the Danube’s 1770 miles banks, Ulm, Linz, Vienna, Bratislava Budapest, Novi Sad… as they slowly floated across the black and white television monitor to the tunes of the music. It has made me dreaming of distant lands along the river. The ultimate Kodak moment of the Blue Danube. But how blue, and how calm and how perfect is the Danube anyway? It is the second longest river in Europe about 1770 miles long. Its headwater in the Black Forest in Germany and it enters into the Black Sea somewhere near the Romanian Bulgarian border after rolling through 10 different countries. The Danube’s River monster, the Huchen or Danube Salmon it can grow up to four feet long and weight 110lbs. 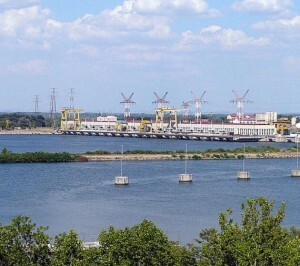 It is one of the most important major transportation water-ways on the continent, has its own unique fauna and flora, including its own river monster, the Danube Salmone or Huchen, that can grow as big as 4 feet and weight 110 lbs. 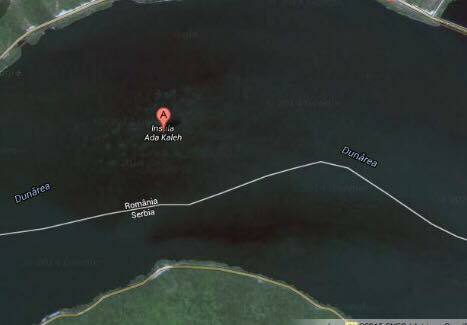 Last, but not the least, the Danube is also a much feared and respected river in large parts of Europe. People along its river valley have a personal, relationship with the river. On the one hand, the river has provided jobs, irreplaceable drinking water, food, helped in building wealth, contributed to prosperity and inspired arts and cultures. On the other hand, its floods have also been the most destructive events that have taken thousands of lives, destroyed crops and wiped out communities over the centuries. As the results of the repeated devastating floods, the river banks of the Danube in Budapest has been repeatedly rebuilt, expanded and improved over the last 200 years. Uniquely, there has been no major superstitions and biblical prophecies applied to the Danube over hundreds of years, as Christian Rohr explains in his study of meteorological history, “The Danube Floods and The Human Response and Perception (14th to 17th Century) “. In fact, there has been a very sober and rational relationship between the river and its human inhabitants as Rohr describes it. People have learned to ignore god and his alleged doings during major devastations and instead of trying to appease God, they have focused on rebuilding and developing more effective flood prevention technics and river control methods . Oddly, the church has shared this approach and has provided generous financial support after each flood to help rebuilding the destroyed lives and communities. the old unenforced riverbanks of Budapest around the turn of the 20th century.They had failed to protect the city from floods over and over again. However, the mighty river cannot be blamed as the single culprit for all the pains and sufferings of its inhabitants. The river is also a long time witness and a passive conduit of its people’s lifestyle, biases, cultural, religious differences, and hubris, especially in the 20th Century. 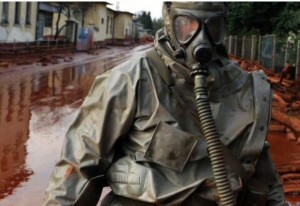 Military personnel in protective gear searches for survivals of the Ajka Aluminum chemical waste product disaster. 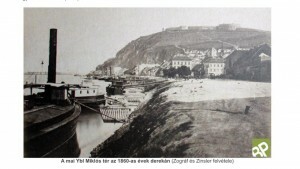 The toxic sludge ultimately ended up in the Danube. The Danube has often been used as industrial waste dump, harnessed for its energy in harmful and devastating ways, and used to hide humanity’s sinister acts as a mass grave for people and war machines. 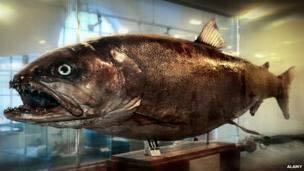 It has also swallowed up cultures that were nihilated in the name of progress. The tragic fate of the frequently romanticized “Turkish island,” Ada Kaleh, or the “Ottoman Atlantis,” as historians named it, on the Danube’s Romanian section has been a longtime Austrian outpost for the Habsburg Empire until it was seceded to the Turks, in the 1600’s. 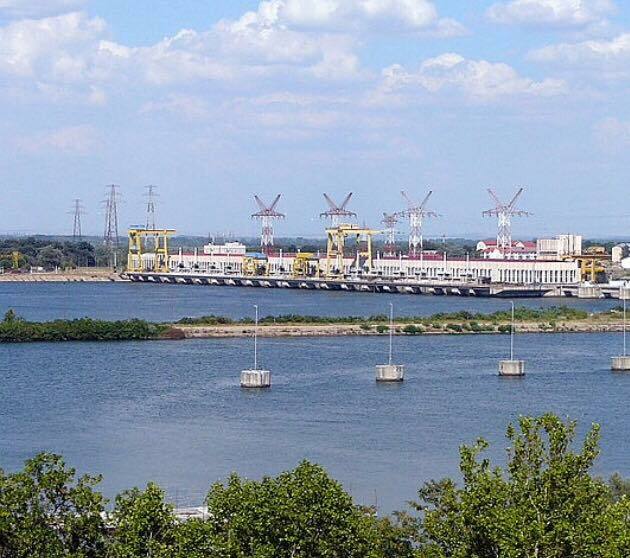 The Ottoman inhabitants of the tiny island, have established a thriving economic and cultural life during their close to 300 years of existence, until the Romanian communist government decided to built the infamous Iron Gate hydro-electric power plant on the Danube in the 1970’s. The newly built dam flooded the island that simply disappeared under water like the city of Atlantis with its buildings and entire unique muslim history and culture. The infamous Iron Gate hydroelectric power plant. 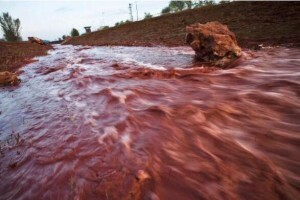 Its dam system flooded the island of Ada Kaleh. When Central Europe’s multicultural melting pot have over boiled time to time, it has brought violence, destruction, ethnic cleansing and suffering for the area along the Danube’s river valley. Two world wars have been started in the region, in which the river has always played an important strategic role. 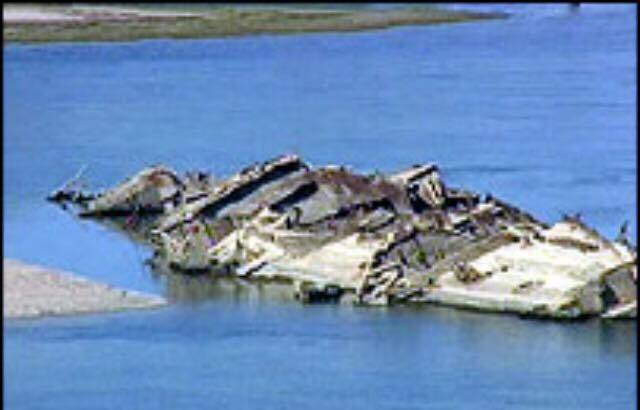 Near the end of WWII hundreds of Nazi river warships were sunken by the Germans to avoid the Soviets to seize and use them against the retreating forces of the Third Reich. 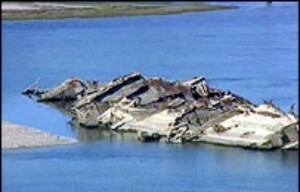 These boats have never been lifted from the bottom of the river and during excessive droughts, the gost ships break though the surface of the water and can be seen from passing boats and from the shores. 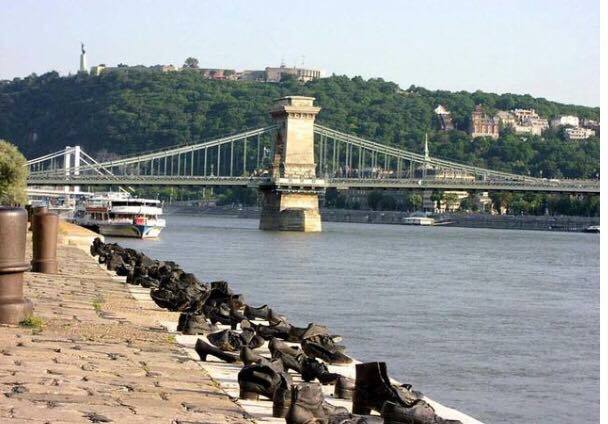 One of the most shameful WWII atrocities along the Danube is memorialized by the abandoned shoes memorial on the river bank of the Danube in the center of Budapest. Between 1944-1945 the henchmen of the Naci sympatizer Hungarian government, executed twenty thousand Jews on the river front of the Danube. The memorial is a chilling testament about one of the darkest moments of humanity. 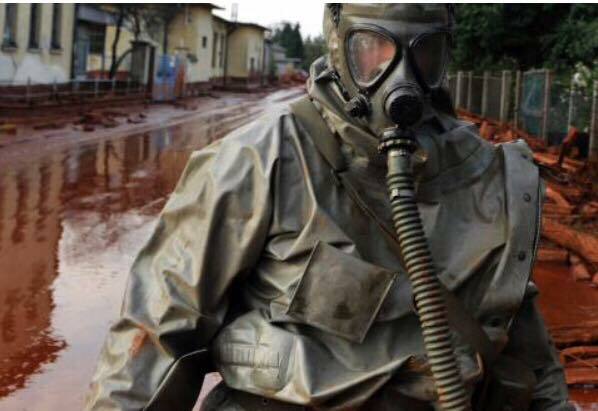 Disasters and tragedies in more recent memories were the cyanid pollution of the Danube from the Romanian gold mines in 2000 and the infamous toxic sludge river pollution from the caustic byproducts of aluminum production from Ajka, Hungary. The heavy sludge broke the levees of the giant storage pools and polluted over 15 sq miles of lands, creeks, displacing and killing wildlife, and livestock. More than 10 people have died and hundreds were seriously injured. Towns and villages in the area have been abandoned and never rebuilt. The chemical sludge ended up in the Danube that has carried the devastating pollution further downriver to other communities. What is the takeaway of these stories? I do not know. Perhaps that the “Blue Danube Syndrome” is really not an isolated chain of events specific to a certain geographic area or its people. While we tend to dismiss our hubris and the plentiful cautionary biblical prophecies, we cannot escape to be repeatedly reminded of our not too bright future. In a twisted way, the entertainment industry and cinema have taken charge of the delivery of prophetic messages by way of rolling out apocalyptic action movies and stories that depicts mankind’s potential gloomy fate in response to our arrogance. Has the cinema industry replaced the role of institutionalized religion or it has become “a religion?” Do movies become the ultimate delivery platforms of biblical prophecies? 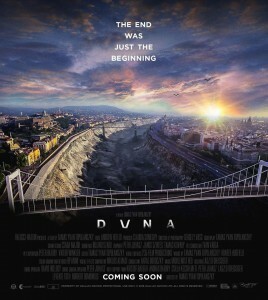 Budapest and the Danube also have their very own apocalyptic film now, produced in 2017. 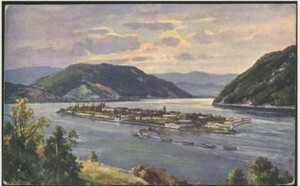 It is titled, “DVNA” (Danube). Tamas Yvan Topolanszky, the young Hungarian director in his nightmarish movie, depicts life in Budapest, immediately after the Danube disappears from its river bed overnight. What is the outcome of the movie? I won’t be able to tell you because the traffic has finally started moving along the river bank and I am not supposed to write on my phone while driving the car. Instead, I start doodling the “Blue Danube” again. This entry was posted in Anka in Budapest 2018, Uncategorized and tagged Ade Kaleh, Agility, Ajka, AKC, Atlantis, Budapest, cultural nihilation, Danube, drought, ethnic cleansing, flood, flood control, herding, Holocaust, Hungary, hydro-electric power plant, industrial disasters, Ottoman empire, pumi, Pumi NY, Pumi US, Pumik, Pumis, river pollution, Romania, Third Reich, toxic sludge, UKC, Warships on June 17, 2018 by sysadmin.